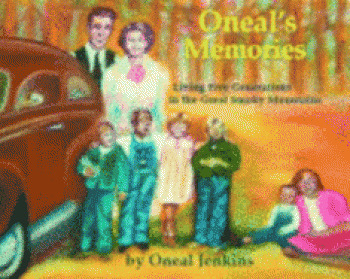 Set in Graham County, Oneal's Memories shares one woman's history of living into the 5th generation of mountain heritage. This is a story that tells of how families lived in Western North Carolina in a time when neighbors knew each others' needs and went out of their way to assist one another .. it was a time when courtiers went "walking" together. The following is an excerpt from the book. The Fourth of July in the community of Proctor in 1935 was a great event in my life. We were having a wonderful time. Several events were taking place such as ball games, horseshoe pitching, picture taking, catching the greasy pig, and many other games. Most of the families had prepared food, so everybody was invited for dinner. What mountian people called "dinner on the ground" meant everybody was welcome. We enjoyed talking to friends, telling jokes, singing songs, and having a merry good time. My boyfriend and I were watching the boys play basketball, when I noticed Faset. We had met several times before. We even rode the same bus to school. He also saw me chopping wood one time and took the ax, and finished chopping wood for me. He helped me catch my pretty red mare, saddle her and placed a bushel of corn on her for me to take to the mill to be ground into corn mill. At that point I was teasing him about the girl he was dating, but I never wanted to date him. But for some reason while watching him play basketball, I realized Faset was a very handsome guy. He had real curly black hair and was a great basketball player. Still I had no thought about dating him. ... And so the love story had it's beginning. Publisher: Catch the Spirit of Appalachia Inc.